Do you ever just want to take a break from those fast-paced action games? Maybe just to float on a lake and take in the calm serenity of nature? Well, you’re not alone, as fishing games have made a surprising resurgence in recent years. Even games like Final Fantasy XV felt the need to have a fishing spinoff included, and sometimes these timewasters can become very addicting (the Zelda games come to mind). After the boom and bust of the casual market on the Wii, it’s time once again for a game to come out with a fishing rod attachment to fill the void on the Switch. Bass Pro is a store dedicated to all things hunting and fishing, and they’re no stranger to bringing the hunting and fishing experience over to consoles. 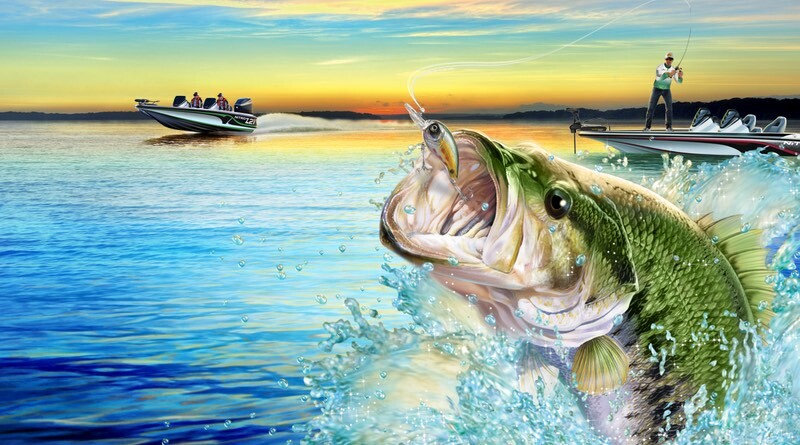 Hop back into the boat with Bass Pro Shops: The Strike – Championship Edition and catch some fish! We would like to thank the wonderful people at Planet Entertainment for providing us with the game bundle for review. The game plays like your standard fishing game. You can drive your boat across several lakes to find the perfect fishing spot. The boat is very easy to control with no wonky water physics getting in the way. The game uses motion to allow you to cast your hook in a variety of different ways and it will take some skill to learn how to do so perfectly every time. Once you get a fish to bite onto your hook you battle with it by trying to drain its stamina while keeping your line from breaking. While simple, these battles can actually drag on for some time depending on how big the fish on the line is. You also have a GPS, which can show you a map of your current lake, as well as other nifty features like your statistics. There are a few game modes you can choose from. Career has you traveling to several lakes across the United States in order to raise your reputation and compete in tournaments. In Quick Fish, you can visit any level you’ve unlocked in career mode without any restrictions. Invitational is unlocked when you complete Career and it really puts your skills to the test in an all-out tournament. Challenge mode lets you and up to 3 other local players take on a series of fun games. Segregating off the multiplayer into its own thing is a huge missed opportunity. It would have been so much fun to fish with your friends via a co-op excursion. The mini-games wear thin after a few plays, so don’t expect to sink much time in the multiplayer arena. When you buy a game on a new, more powerful system you expect the graphics to get an upgrade. Not much has been improved in the visuals department over the Wii fishing games that came out years ago. That being said, the game does feature small details that are appreciated. The locations you travel through actually feel full of life. You’ll see other fishermen in their boats cruising across the water and stopping to occasionally fish. The lakes are full of other fauna, like schools of fish and Crocodiles, and you can even spot cars driving off in the distance on the roads. You get a sense that you are playing in a living, breathing environment, but the waterways themselves are somewhat small and feel last-gen in presentation. The game is full of peaceful music to listen to as you wait for something to grab onto your line. Most of the game’s soundtrack is great with each location and game mode having its own music. The levels do have some ambiance to them, though its mostly birds chirping along with the sound of the water flowing by. The sound effects definitely take a backseat to the tunes in the game, which is oddly OK because they fit the mood. The physical bundle of the game comes with the Power Cast Rod & Reel peripheral. This has to be one of the best add-ons I have seen for the Nintendo Switch yet. From the moment I unwrapped it I couldn’t wait to see how it worked with the game. This is one of those rare cases where the extra piece of plastic is justified because it really adds to the experience. It relies more on the motion of the Joy-Con controllers rather than pointing at the screen, so the rod and reel work wonderfully. If you have a choice, be sure to spend the extra $10 to purchase the bundle as it works rather well and feels so much better in your hands than just holding the Joy-Cons. Bass Pro Shops: The Strike – Championship Edition has online tournaments in the works that should go up several months after the game launches. We were unable to test this feature for review, but it should help add to the longevity of the title. This mode will allow players to try to get the high scores on the leaderboard to win actual prizes. So practice up now in preparation! Overall the game is a worthy attempt to fill the void of fishing games on the Switch. I would love to see the developers take a huge leap for the next game and deliver us an open world experience that’s more cohesive and spend more times on the graphics. Still, if you’re looking for a good fishing game, this one should suffice. Bass Pro Shops: The Strike – Championship Edition is a worthy attempt at a fishing game on the Switch. The graphics aren’t the greatest, but little details in the environment help with the world building. The rod & reel attachment adds a lot to the immersive aspect of the game. It’s a good choice for now, but hopefully some innovations occur in this space for future titles in this genre.